Hi, lovelies! I'm very excited about sharing this post because I teamed up with JD Williams to bring you a holiday party look. As many of you know, I love to wear black for holiday parties and of course, this look was not going to be the exception. The outfit that you are seeing today is perfect for a black-tie holiday party or a formal event. JD Williams has a variety of beautiful garments for the evening wear, however, this dress stood out because of its elegance, glamour and retro vibe. I must confess that this dress reminded me of something that Joan Collins would wear. Her type of glam, in my opinion, is timeless. 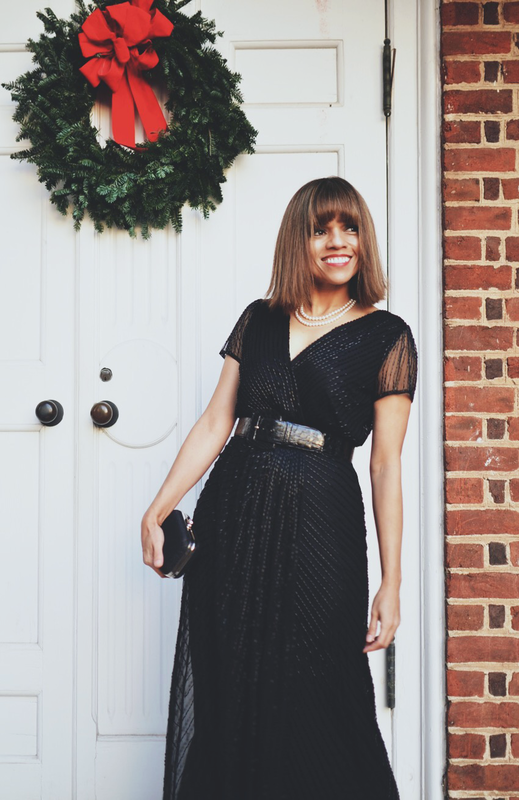 Scroll down to see how I styled this dress with garments that complimented its style and also appropriate for a formal holiday party. Dress: c/o by JD Williams/Clutch: c/o JD Williams/Pearls: Similar/Heels: Christian Louboutin. Similar/Tights: Laundry/Belt: Vintage. Similar/Jacket: Vintage. Similar.